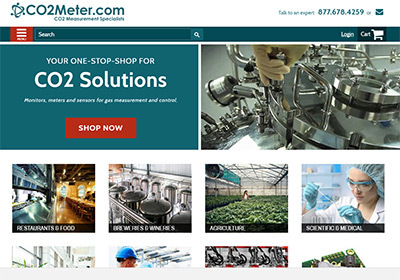 CO2Meter, Inc. This client wanted to sell indoor air quality products online. The goal was pure e-commerce. Since 2009, through SEO best practices and targeted Google AdWords, sales have risen to over $3M per year online. In addition, if you Goggle “CO2 Meter” you’ll see this web site ranks in the top few positions on the first page. Signs by Crannie. 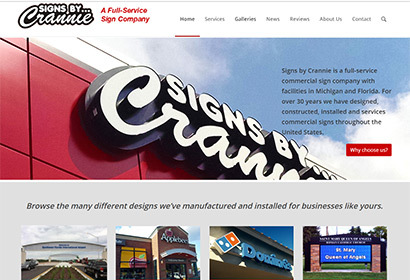 Like most clients, the folks at Signs by Crannie had lots of ideas but no one to crystallize them into words. Over two afternoons, I was able to interview the owner, then write all the copy for the website. The client provided raw photography, and I put both together using a commercial WordPress template. The client has since risen from no website presence in Google to 1st page for many of their search terms. In addition, the companion Facebook page rose from less than 100 to over 350 engaged followers in the first 12 months through posting alone. JD Lab. 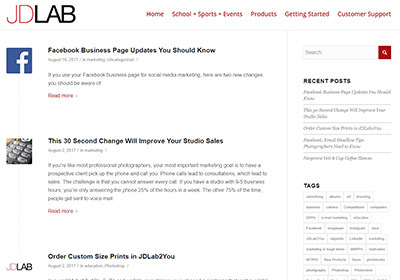 JD Lab is a printer for professional photographers across the midwest. I wrote all the content for the website, created the blog, and wrote over 700 articles on marketing professional photography as well as a weekly newsletter for SEO. 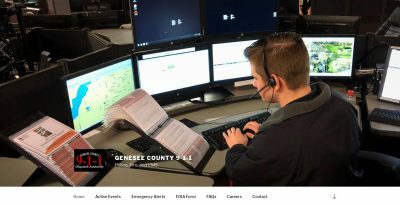 GeneseeCounty911.org. This client came to me with an out-dated website not optimized for mobile phones. it has fallen into disrepair and no one at the organization wanted to take responsibility for it. Working with the director and their IT department, I was able to get completely redesigned mobile-friendly website up and running on time and on budget. 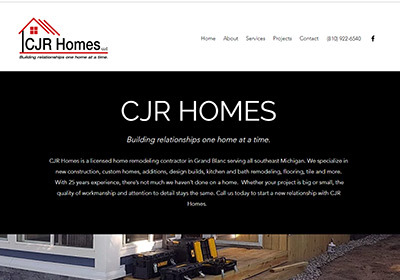 CJR Homes LLC needed an online presence for their new remodeling and contracting business. Like many of my clients, it needed to look good and be done quickly with limited resources. I found the domain, cleaned up the original logo, designed the shirt/truck graphics, color corrected his cell phone images in Photoshop, wrote the copy, created the website and registered it online with the most important search engines. In less than 15 days he’s already being found for his company name on Google. 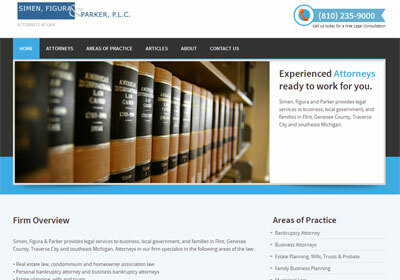 Simen, Figura & Parker is an established law firm in the Flint area. They needed not only to update their website, but to raise their online presence in Google. By a combination of updating their website to a blog, creating a local online presence, and regular content-rich articles with targeted keywords, they are for the first time getting contacts via their website. 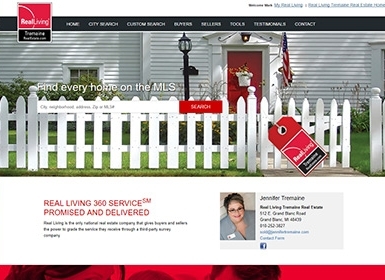 Jennifer Tremaine, Realtor started with no presence on Google. We started SEO with new marketing copy using targeted keywords, new photography and branding, new content-rich pages, social media and a link-building campaign. Later, I was hired by the Tremaine company to update 30+ realtors to the new corporate standard. In addition, I hold in-house SEO and social media training classes for the company. Appraisal Recheck. 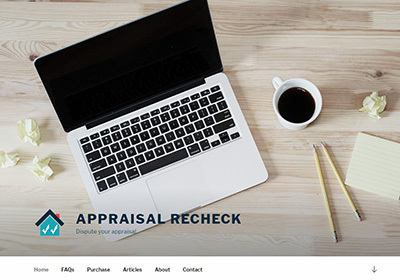 This client was looking for a modern, attractive mobile friendly website that would appeal to real estate agents looking for a solution when appraisals came in too low. Using a simple, yet bold design, a PayPal link, and the ability to upload PDF files we were able to get this new business off the ground quickly at a reasonable cost. 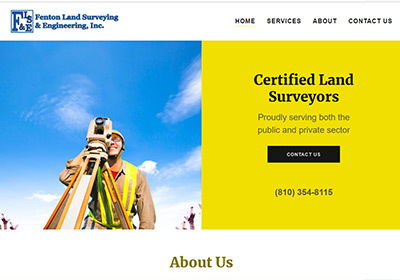 Fenton Land Surveying & Engineering. A quick project for a new company that needed a responsive (mobile) website up and running quickly. No images or copy. Thanks to some SEO, after 2 months they are already showing on the front page of Bing and Google for their keywords. 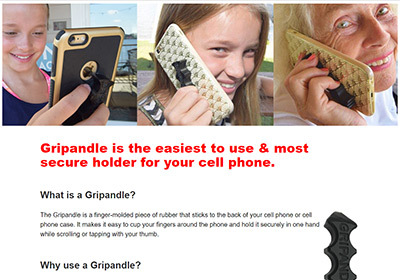 Gripandle.com. The client had an idea for a new product, and needed a website to show it. With only an online interview and 5 photos, I was able to create a e-Commerce website in less than 24 hours for them to test their product concept to friends and family..
Runyan Lake East. This client was looking for a site to showcase a new housing development. The entire site – from graphics to copy – was designed to evoke a combination of an exclusive, yet family friendly lifestyle. While it is a bit older, it still manages to rank on the first page of Google for its keywords and has resulted in the sale of over a million dollars in property. 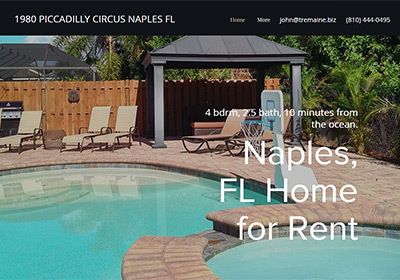 Tremaine Real Estate – Naples. The client had recently purchased a home in Florida and wanted to rent it out. A property management company was charging hundreds of dollars a month to list it online. With only a USB drive of images and an idea, in 48 hours I had completed this one-page branded brochure site Facebook page that the owner could use to market the property on their own. 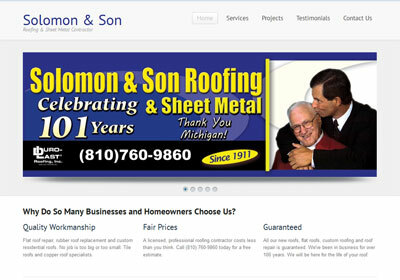 Solomon & Son Sheet Metal & Roofers. The client went from no web presence to a complete website featuring over 50 completed projects that he could show prospective clients on his iPhone. In addition, using SEO we were able to make him competitive on Google for his targeted keywords. In addition to learning about each client’s business, I have worked closely with clients in multiple industries and have managed several political campaigns including Township Supervisor, Treasurer and Trustee, County Commissioner, and Michigan State Representative. Get your business noticed online.